You will not find cheaper! The MY Obsession does not operate anymore as it caught on fire and sunk during the 2016 / 2017 season. 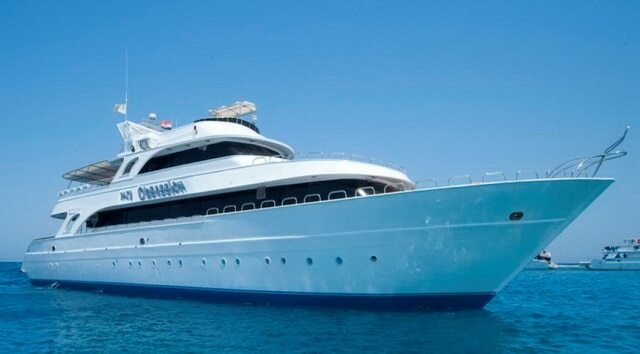 Please view this page to find other liveaboards diving and cruising the Red Sea. MY Obsession liveaboard was refurbished in 2008, all cabins have en-suite bathroom and facilities which ensures ultimate privacy for divers on board. The massive dive deck and platform on this Red Sea liveaboard provides plenty of area for suiting up, along with loads of storage space for your personal equipment. For underwater photographers there is a separate rinse tank for cameras. Watch this video and check how this liveaboard live up to its name. Want to eat barbeques for lunch or dinner? Well, they are a part of the delicious menu which consists of local delicacies and international cuisine served buffet-style in the air-conditioned restaurant found on the main deck, along with its own bar for your relaxation post-dives. You can also choose to devour your meal in the open- air dining area if you desire! Come and have an amazing experience on board with the great customer service, quality diving assistance and enthralling liveaboard diving experience offered by MY Obsession! If you have been diving on board this liveaboard dive boat in Marsa Alam & Red Sea & South Red Sea, please share your review and let us know what you thought. Please post your comments in the review section below, by doing so you will help fellow divers to plan their next diving trip . No Liveaboard Review yet on this page, please comment if you have been on the MY Obsession cruise. Nitrox is free of charge! You won’t lose any connection from your friends all over the world with the 3G wi-fi available on board MY Obsession.